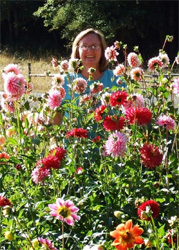 The Dahlia Divas have grown quality dahlias in Pleasant Hill, Oregon for 14 years. We have provided a local florists, local designers, and customers quality cut flowers since 2005. Our dahlia tuber sales have been successful, and we look forward to another sale in the future. 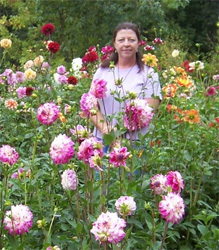 With a passion for gardening, Carrie began growing dahlias as a hobby in 1992 after visiting the Swan Island Dahlia show. I purchased six dahlias, Ted's Choice, Marmalade, and several others that have slipped my memory. Those six dahlias turned into two 80 foot rows of dahlias, by 1994. My growing was limited while living in Portland, and we were planning a geographical move to Pleasant Hill, OR the summer of 2001. The dahlias needed to be planted, so we packed up the tubers, and planted them in Pleasant Hill at my husband's parents house. Over the next several years with more space, it was exciting to obtain more varieties and increase our number of dahlias. By 2004 we were growing 120 varieties of dahlias. At the end of the 2004 growing season, while working for a local florist Rythmn and Blooms, we began selling the cut flowers to Rythmn and Blooms for arrangements and weddings. That was the year the Dahlia Divas were born! Tina also made a geographical move to Springfield, Oregon from California. She would drive out to Pleasant Hill, and to visit her aunt and uncle. Frequently, she stopped at the dahlia field on her way home, and would walk through the rows, and rows of dahlias. She would take pictures of her favorite flowers. It was amazing that dahlias grow in so many shapes, sizes and colors. With a passion for being outdoors, she took quite an interest in the dahlias. It was the end of the growing season, and she was ready to dig the dahlia tubers. Time was limited, so we decided to leave the dahlia tubers in the ground over the winter, and dig in the Spring. It was the Spring of 2005, the temperature was warm, and it was time to dig, divide, and replant the dahlia tubers. To our surprise three fourths of the tubers were rotten. It was disappointing, and a rebuilding year. We replaced our favorite flowers, and purchased quite a few new varieties. We have learned from each year's experience with dahlias, and nothing has changed our minds about loving dahlias, growing dahlias, and providing our customers with the highest quality dahlia tubers, cut flowers Pleasant Hill has to offer.